Wake up, it's snowing. 10 degrees F. The wind is blowing, the sky is white. There's an ice mountain in the backyard where I dump the snow from the driveway. I use a scoop, not a shovel: load it up and push it over the deck to the backyard. There's a steep slope below the deck, down to the summerhouse. Well there's so much snow, that whole space is full. In fact I have to go uphill before I can dump the load. The snow slides down right into the summerhouse now. I can almost walk onto the summerhouse roof from my ice mountain. Pretty good view of the neighborhood up there. I like to scoop, it's peaceful and a good workout. My arms, shoulders, and thighs ache from pushing the snow. Yesterday it was wet and heavy. Snow predicted for just about every day this week. Just checking... yes, still winter in Maine. How do you shield yourself from negative energy? I'm talking about thoughts, feelings, and statements from people around you. I mean anger, racism, and violence. When my heart chakra is wide open, those types of energy are shockingly unwelcome. So I shield myself. I set up a boundary. Usually I use a pink bubble. I visualize the bubble around me, filled with love and light. The outer surface is iridescent, and reflects negative energy back to the person who emits it, or sends it into the multiverse to be transmuted back to love energy. Sometimes, when the negative energy is more forceful, I visualize a brick wall. I also ask my angels and guides to protect me. At my earliest convenience I dismantle the wall or pop the bubble. I reach around my body and pull out any stray bits of energy that don't belong to me; I release the energy back to the multiverse. I open my chakras and shift my focus from protection to forgiveness. I spent some time at the BMV today. That's the Bureau of Motor Vehicles. Here's some advice. Don't go at 1:30 pm on a Wednesday after they've been closed for 4 days. I got ticket number 218 and number 175 was called as I looked for a place to sit. "How long will it take," I wondered. "Hmmm, 6 windows, 5 minutes each, and 43 people ahead of me. Maybe about half an hour." Well that was optimistic of me. Ten minutes later they called number 177. Oh dear. I saw young fathers with toddlers, old women with egg-shaped bellies, a woman with an oxygen tank in a cute red backpack, skinny girls in jeggings, skinnier Somali dudes in baggy jeans, and a short woman wearing a purple sweater and purple pants. People lined up for license photos, smiling, tugging down their shirts and hoisting up their pants. As if their clothes would show. One man told the story of his 4 am visit to the ER for "Well, you can guess what, can't you? It wouldn't come out!" he shouted to the haggard woman across the aisle. "I couldn't stand the pain. I don't want to say it here, but I bet you can figure it out!" he laughed. Each clerk had a black box over his or her cubicle. Each box lit up with red numbers when there was an opening. I watched the numbers. Sometimes people gave up and left, and then we'd skip numbers, sometimes several in a row. That was thrilling. Sometimes people couldn't produce the required documentation and were quickly turned away. You could see the grim discouragement in their faces and shoulders. I hoped I had the right papers. After an hour I was getting close. We skipped over 214, 215, 216, and 217: all no shows. Me! My clerk had limp hair, a yellow rictus of a smile, and soiled pants pulled up to his chest. I loved him. He processed my paperwork in a flash and I left with a precious slip of paper. My advice, and it's good because it came straight from my man: best time to go to the BMV is midmorning, midweek, on a regular week. This was a short week. Closed Monday because of President's Day and closed yesterday because of a state furlough day. That's a day when everything is closed in an effort to save money. Today was not a good day to go. Well, it was for me. I got to relax, watch people, and completed my errand successfully. More advice: bring a book to pass the time, a utility bill, and a passport. Oh, and your waist is not going to show in your driver's license photo, so don't bother sucking it in. That's all. See you on the street. - Mark LaFlamme, author of Box of Lies, Dirt, Vegetation, The Pink Room, and Asterisk. This morning I called the oil company and talked with a nice receptionist, a rude and sarcastic manager, and a courteous manager. Home heating oil, that is. I explained that they had my check on Friday morning, that someone called to verify my account, yet the oil was not delivered. "Did you want oil delivered?" he asked. "Yes, that's why I sent the check," I replied. "You should have known the delivery would be on Monday," he countered. "How would I know that?" I asked. "I ran out of oil on Sunday and had to pay $125 for an emergency delivery. I would like a refund or credit to my account for the $125". "I still have to pay the driver. Do you want me to take back his pay?" So no refund. No credit. I called another company and set up an account. My lovely oil tank. Cost over $600 to fill it 5/8 full. Well there. Had to call for an emergency delivery of fuel oil for which I was charged $125. I tried to tough it out: turned thermostat to 58F, let the dishes pile up, etc. Then I remembered I'm not a camper girl. I mean, maybe I could be. Rough it: how fun! So I got the oil and cranked the heat back on, washed dishes. Now that was fun. So fun I swiffered the floors, vacuumed, shook out rugs, watered the plants, and put stuff away. Now my house is alive, warm, and clean. Next time I mail the check to the oil company when the tank is 3/8 full, not 1/8 full. Yet since they had my check last week, I will call and negotiate. If they demonstrate excellent customer service I will remain a customer. If not, phh, plenty other oil companies around. hey neighbor, can I borrow a cup of oil? 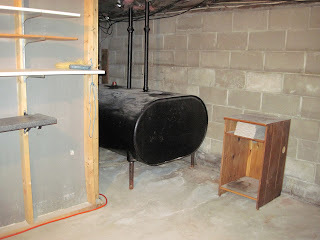 My home heating oil tank is nearly empty. It's on the "M" in EMTY. That's right, that's what it says: EMTY, no P.
Last week the tank was down to 1/8; I'd been watching it every day for 2 weeks. I had the check ready and in the envelope. On Wednesday, when it went below 1/8 I sent the check to the oil company. They usually come right away. Friday they called to ask where I wanted the oil delivered. "To the address on the check?" the nice lady asked. I expected the oil yesterday, Friday. Or today. They didn't come. Meanwhile it's been temps in the teens and a whirling wind, wind chills in the single digits, or lower. Right now it's 17F, feels like 3. Every time I hear the boiler switch on I run down cellar to look at the indicator on the tank. Still on M.
Tomorrow is Sunday and they don't deliver unless you pay extra. I turn the heat down. I'll wait to shower and do dishes. I turn on the oven and a space heater. I wish I had an electric blanket. When speaking with physicians, I like to present reiki as a cultural choice rather than a scientifically proven healing modality. Most physicians will support a patient's cultural practices, as long as they do no harm. I haven't found a single study associating reiki with harm to a patient. Have you? I wonder why my hands sometimes feel hot and tingly, and other times cold - and also why the client's perceptions of heat and coolness sometimes differ from mine. I also wonder about my perceptions when my hands are on the client. Sometimes I feel pulsing or throbbing, sometimes I have the sensation of chunks or packets of energy. Sometimes when I feel nothing, the client is nearly overwhelmed with sensations. Odd. I don't know how reiki works. It's supposed to help people feel better. Most people who try it seem to like it. Fluffernutter is 12! This is a pic of her last month on Mt David. Snowshoed up Mt Apatite. Found a red claw. Turkey? Do they have red feet? It looks reptilian or dinosaurish to me. I brought my snowshoes, but hardly needed them. The trails were packed and icy. Mostly I carried my snowshoes, but put them on when I wanted to go off the trail to look at something. I got a close look at this rock. There are quarries there, but I didn't see them. Everything's covered with 4 feet of snow. If you click on this link: Mt Apatite, you can read about the quarries. We talked about angels after a reiki session yesterday: me, another practitioner, and the client. We talked about our visions of angels. The client shared his vision. He said he'd seen an angel, but no wings. The other practitioner told us about an angel she saw one night. He had huge wings and an impressive, silent presence. I told them about the dream I had once. I was an angel and I had wings. I could feel them coming out of my shoulders, could feel the muscles required to fly. The wings were enormous, way bigger than me. My shoulders were tired when I woke. 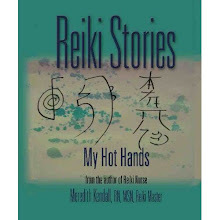 What are your favorite reiki books? I'm developing a new class. I like books by Diane Stein, Penelope Guest, and Pamela Miles. Any other favorites out there? During reiki today I held my hand over my client's abdomen. I imagined I saw a yellow flame burning in the space between. My hand felt hot. The client was smiling. Did reiki today. Saw the daikomyos turn into PacMen and munch away at unnecessary stuff. 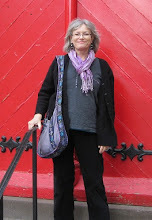 Did a fun interview with David Wisehart of Kindle Author. You can read it here: click! 2 feet of fresh snow, more on it's way tonight and Monday, zero degrees. Yes, it's still winter in Maine. Hey, at least it's sunny! My plan for the morning: put on my snowshoes, get the roof rake, and rake snow off the roofs. I've got the house, the garage, and the summerhouse. Here in Maine we have to get the snow off the roof before the weight of it collapses the structure. You'd be surprised how much snow weighs. Light, white, fluffy stuff - right? According to Ken Hellevan of the U North Dakota a cubic foot of snow can weigh 7- 20 pounds per cubic foot. Another source says snow can weigh 30 pounds per cubic foot. That's right between coffee (27 #/cf) and flour (37 #/cf). So I'm headed out into the Arctic cold with the roof rake. Electrocution alert: don't touch power lines with the metal rake. Yes, still winter in Maine. Have you heard of the Coral Castle? It's in Florida. Evidently some dude, 5 ft tall and 100 pounds, built a stone castle and gardens. By himself. The stones weigh several tons, and fit together precisely. He claimed to use the secrets of the pyramid-builders of Egypt, Peru, and the Yucatan. It's postulated that he used magnetism, reverse gravity, and/or sound to lift the stones into the air and into place. Add this to my list: Destinations. Cool! Someone read my post. Someone gave me a flashlight with a solar panel. It's perfect and I'll use it. I'll set it in the sun during the day, and use it at night to adjust my thermostat. Probably shouldn't mess with it, but when I get hot in the night I turn the thermostat down 2 degrees. Then I get cold and turn it up 1 degree. Solar-powered flashlight. Who knew? Now I want a solar-powered laptop, phone, house, and car. If you haven't already, please invent those things, thank you very much. Wow! What a winter. Took the dog for a walk. Saw these critters in a park down the street. They usually stay up north, in the woods. They've been driven to the city by the snow and cold. Walked on the beach with friends. It was cold and overcast, spitting snow. Not too many people, no beach balls, no lifeguards. Saw lots of big clams, don't know if they were left on the beach by seagulls or clam diggers. Almost brought them back to the condo to add to the seafood chowder. No snow on the beach. Does the salt melt it, or the wind blow it away? There was lots of snow in town. Lots of icicles too. What's up with the gauges in my world? According to my bathroom scale I lost 30 pounds overnight. Where did that 30 pounds go? Right into my outdoor thermometer, registering 30 degrees higher than it ought to. Yes, 46 F (7C) sounds pretty good. My thermostat is also haywire. If I set it at 68 F it can be anywhere from 60 to 75 degrees in my house. And what about my internal thermostat? Also has a mind of it's own. One minute I'm being stabbed with icicles and the next I'm in a sauna. The speedometer in my car quit working last week. I have no idea how fast I'm going. If we can't count on scales and numbers, then what do we trust? Ah! Good old reiki. It's always there, always reliable, and always shows the way. Now, where are my skinny jeans?